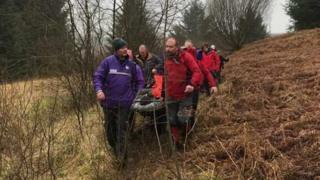 A mountain rescue team has been called to assist a man staying at a remote bothy after he injured himself with an axe. Moffat Mountain Rescue Team went to Brattleburn Bothy, north-west of Beattock, on Sunday to assist the man. The volunteers were asked by local police to assist. They carried him by stretcher to the nearest point which could be accessed by ambulance.